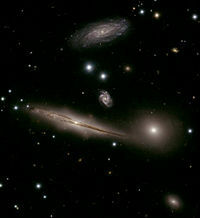 The galaxies of HCG 87, about 400 million light-years distant. The large edge-on spiral, the fuzzy elliptical galaxy immediately to its right, and the spiral near the top of the image are members of the group, while the small spiral galaxy exactly in the middle is a more distant background galaxy. Credit: NASA/ESA. Galaxy groups and clusters are the largest gravitationally bound objects that have been detected in the universe. They form the densest part of the large-scale structure of the universe. Groups and clusters may contain anywhere from three to thousands of galaxies. The smaller aggregates, typically containing less than 50 galaxies each, are referred to as galaxy groups, and the larger aggregates are known as galaxy clusters. There is, however, no sharp dividing line between the two. The clusters themselves are often associated to form larger aggregates called superclusters. For example, the Virgo Cluster, located in the constellation Virgo, includes 1,300 or more galaxies. Our own galaxy, the Milky Way, is located in a group called the Local Group, which contains more than 40 galaxies. The Virgo Cluster forms the heart of the larger Local Supercluster, of which the Local Group is an outlying member. Large clouds of hot gas (or plasma) (at 30 to 100 million °C) surround the galaxies and fills the space between them. This matter has greater mass than that of the galaxies in the cluster. To account for the gravitational pull needed to hold the galaxies together, scientists have postulated the presence of dark matter that may have 10 times more mass than the total mass of the galaxies and surrounding gas. This dark matter is undetectable by telescopes. In models of the formation of groups and clusters of galaxies, astronomers believe that the smallest structures are formed first, as clumps of dark matter and associated galaxies are drawn together by gravitational attraction. Over time, the smaller groups merge to form clusters of increasing size. Clusters appear to have begun forming 10 billion years ago and it is thought that they continue to form today. Groups of galaxies usually contain fewer than 50 galaxies in a diameter of 1 to 2 megaparsecs (Mpc) (1 Mpc is approximately 3,262,000 light-years, or 2×1019 miles). Their mass is approximately 1013 solar masses. The spread of velocities for the individual galaxies is about 150 km/s. However, this definition should be used only as a guide, as larger and more massive galaxy systems are sometimes classified as galaxy groups. When observed visually, clusters appear to be collections of galaxies held together by mutual gravitational attraction. However, their velocities are too large for them to remain gravitationally bound by their mutual attractions, implying the presence of either an additional invisible mass component, or an additional attractive force besides gravity. X-ray studies have revealed the presence of large amounts of intergalactic gas known as the intracluster medium. This gas is very hot, between 107K and 108K, and hence emits X-rays in the form of bremsstrahlung and atomic line emission. The total mass of the gas is greater than that of the galaxies by roughly a factor of two. However, it is still not enough mass to keep the galaxies in the cluster. Since this gas is in approximate hydrostatic equilibrium with the overall cluster gravitational field, the total mass distribution can be determined. It turns out the total mass deduced from this measurement is approximately six times larger than the mass of the galaxies or the hot gas. The missing component is known as dark matter and its nature is unknown. In a typical cluster, perhaps only 5 percent of the total mass is in the form of galaxies, maybe 10 percent in the form of hot X-ray emitting gas and the remainder is dark matter. Brownstein and Moffat use a theory of modified gravity to explain X-ray cluster masses without dark matter. Clusters typically have the following properties. They contain 50 to 1,000 galaxies, hot X-ray emitting gas, and large amounts of dark matter. The distribution of these three types of components is approximately the same in the cluster. Their total masses generally range from 1014 to 1015 solar masses. They typically have a diameter from 2 to 10 Mpc. Notable galaxy clusters in the relatively nearby universe include the Virgo cluster, Hercules Cluster, and the Coma Cluster. A very large aggregation of galaxies known as the Great Attractor, dominated by the Norma cluster, is massive enough to affect the local expansion of the universe (Hubble flow). Charles Messier discovered the first galaxy cluster, called the Virgo Cluster, in 1784. In the last few decades, clusters are also found to be relevant sites of particle acceleration, a feature that has been discovered by the observation of non-thermal, diffuse radio emissions as radio halos and radio relics. Clusters of galaxies should not be confused with star clusters such as galactic clusters and open clusters, which are structures within galaxies, as well as globular clusters, which typically orbit galaxies. Groups, clusters and some isolated galaxies form even larger structures, the superclusters. At the very largest scales of the visible universe, matter is gathered into filaments and walls surrounding vast voids. This structure resembles a foam. Optical or infrared: The individual galaxies of clusters can be studied through optical or infrared imaging and spectroscopy. Galaxy clusters are found by optical or infrared telescopes by searching for overdensities, and then confirmed by finding several galaxies at a similar redshift. Infrared searches are more useful for finding more distant (higher redshift) clusters. X-ray: The hot plasma emits X-rays which can be detected by X-ray telescopes. The cluster gas can be studied using both X-ray imaging and X-ray spectroscopy. Clusters are quite prominent in X-ray surveys and along with AGN are the brightest X-ray emitting extragalactic objects. Radio: A number of diffuse structures emitting at radio frequencies have been found in clusters. Groups of radio sources (which may include diffuse structures or AGN have been used as tracers of cluster location. At high redshift imaging around individual radio sources (in this case AGN) has been used to detect proto-clusters (clusters in the process of forming). Sunyaev-Zel'dovich effect: The hot electrons in the intracluster medium scatter radiation from the cosmic microwave background through inverse Compton scattering. This produces a "shadow" in the observed cosmic microwave background at some radio frequencies. Gravitational Lensing: Clusters of galaxies contain enough matter to distort the observed orientations of galaxies behind them. The observed distortions can be used to model the distribution of dark matter in the cluster. Clusters of galaxies are the most recent and most massive objects to have arisen in the hierarchical structure formation of the universe and the study of clusters tells one about the way galaxies form and evolve. Clusters have two important properties: their masses are large enough to retain any energetic gas ejected from member galaxies and the thermal energy of the gas within the cluster is observable within the X-Ray bandpass. The observed state of gas within a cluster is determined by a combination of shock heating during accretion, radiative cooling, and thermal feedback triggered by that cooling. The density, temperature, and substructure of the intracluster X-ray gas therefore represents the entire thermal history of cluster formation. To better understand this thermal history one needs to study the entropy of the gas because entropy is the quantity most directly changed by increasing or decreasing the thermal energy of intracluster gas. The following is a list of some well-known galaxy clusters and groups. Major nearby groups and clusters are generally named after the constellation they lie in. Many groups and clusters are named after the leading galaxy in the group or cluster, based on an ad hoc naming system. Local Group This galaxy group contains the Milky Way, the galaxy that includes the Earth. Bullet Cluster This cluster is actually two galaxy clusters in collision. Leo Triplet This is named for the fact it contains only three galaxies. This small group of galaxies lies in the constellation Leo. Robert's Quartet It was named by Halton Arp and Barry F. Madore, who compiled A Catalogue of Southern Peculiar Galaxies and Associations in 1987. This is a compact group of galaxies. Seyfert's Sextet This is named after its discoverer, Carl Seyfert, and at the time it appeared to contain six external nebulae. It is also called the NGC 6027 Sextet, after its brightest element. There are actually only five galaxies in the sextet, and only four galaxies in the compact group. The group is therefore more properly called HCG 79, because the name refers to a visual collection and not a cluster. ↑ 1.0 1.1 Groups & Clusters of Galaxies. Chandra X-ray Observatory, NASA. Retrieved February 18, 2009. ↑ G.M. Voit, Tracing cosmic evolution with clusters of galaxies. Reviews of Modern Physics, 77(1): 207-258. ↑ J.R. Brownstein and J.W. Moffat, 2006, Galaxy Cluster Masses Without Non-Baryonic Dark Matter. Mon.Not.Roy.Astron.Soc. 367:527-540. Retrieved February 9, 2009. ↑ A. Biviano, 2000, From Messier to Abell: 200 Year of Science with Galaxy Clusters. IAP 2000 meeting, Paris, July 2000. Retrieved February 9, 2009. Binney, James, and Michael Merrifield. 1998. Galactic Astronomy. Princeton University Press. ISBN 0691004021. Dickinson, Terence. 2004. The Universe and Beyond. 4th ed. Firefly Books Ltd. ISBN 1552979016. Kuhn, Karl F., and Theo Koupelis. 2004. In Quest of the Universe. Sudbury, MA: Jones and Bartlett Publishers. ISBN 0763708100. Sparke, L.S., and J.S. Gallagher III. 2000. Galaxies in the Universe: An Introduction. Cambridge, UK: Cambridge University Press. ISBN 0521597044. Groups and Clusters of Galaxies – Chandra X-ray Observatory. Harvard-Smithsonian Center for Astrophysics. Galaxy Clusters and Large-Scale Structure – Cambridge Cosmology: Galaxies. Dwarf Irregulars and Galaxy Clusters – The Hubble Heritage Project. Oldest, most distant galaxy clusters found – Associated Press, Jan. 5, 2004. MSNBC. Oldest Galaxy Cluster Found – Schilling, G. April 12, 2002. Science Now. History of "Galaxy groups and clusters"
This page was last modified on 18 May 2017, at 14:51.